The temptations of a new genetically informed eugenics and of a revived faith-based, world-wide political stance, this study of the interaction of science, religion, politics and the culture of celebrity in twentieth-century Europe and America offers a fascinating and important contribution to the history of this movement. 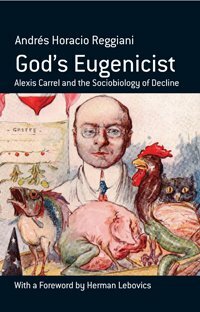 The author looks at the career of French-born physician and Nobel Prize winner, Alexis Carrel (1873-1944), as a way of understanding the popularization of eugenics through religious faith, scientific expertise, cultural despair and right-wing politics in the 1930s and 1940s. Carrel was among the most prestigious experimental surgeons of his time who also held deeply illiberal views. In Man, the Unknown (1935), he endorsed fascism and called for the elimination of the "unfit." The book became a huge international success, largely thanks to its promotion by Readers' Digest as well as by the author's friendship with Charles Lindbergh. In 1941, he went into the service of the French pro-German regime of Vichy, which appointed him to head an institution of eugenics research. His influence was remarkable, affecting radical Islamic groups as well Le Pen’s Front National that celebrated him as the "founder of ecology." Andrés Horacio Reggiani was Tocqueville Scholar and Visiting Professor at the Ecole des Hautes Etudes en Sciences Sociales. Currently he is Professor of European History at Universidad Torcuato Di Tella in Buenos Aires, Argentina.